Toy Wishes magazine picks Barbie Girls MP3 player, Fisher-Price's Smart Cycle and Rubik's Revolution among toys of the year. Ever wondered what a bug looks like magnified 200 times? How about a hair or a dollar bill? 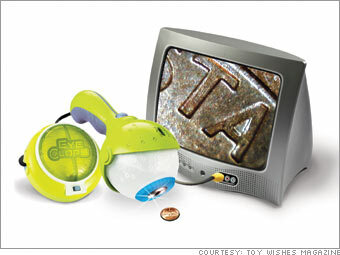 The Eye-Clops is a powerful electronic magnifier that plugs into your TV to give a new perspective on virtually anything that kids want to explore.